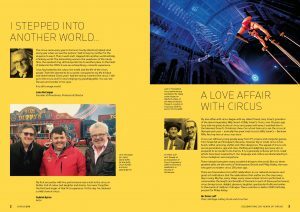 Circus250 has been the coordinating body for the promotion and dissemination of all the fabulous events throughout the UK and Ireland celebrating 250 years of circus in 2018. It’s been a huge joy to work with so many inspiring, creative and pioneering artists, curators, event managers, schools, libraries, performers, directors, producers and more… Thank you all, and see you down the road! Our printed programme is still available and is a thing of delight. Articles from circus experts – covering art, history, training and much more – accompany glossy photos and a listings guide for celebratory partner events around the UK & Ireland. Our price for supporters is £7.95, plus postage and packing, with reductions available for bulk orders. 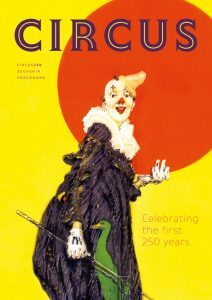 To get a copy of our order form, email bigtop@circus250.org. Don’t forget you can also still order our #Circus250 button badges, available from the same order form! * First Day of Circus launched at Natural History Museum, London with Handstand for Hope – a handstand under the giant whale Hope. Secretary of State for Culture watches circus on his first day in office. * Each of the six Cities of Circus project the Circus250 logo on to a significant building to mark opening of the year. * The Economist picks Circus250 as one of the ten top worldwide trends for 2018 – and makes a film about it! * Circus250 online listings launched in partnership with CircusTalk. * Circus250 launches Women in Circus short film to mark International Women’s Day. * Dame Laura Knight’s iconic circus painting The Grand Parade comes out of storage at Newport Museum for the first time in decades and tours to Royal Academy of the West of England, Bristol. * An entire edition of BBC Radio 4’s Woman’s Hour is handed over to celebrate and discuss women in circus. Listen here. * Circus250 features at Young Stage Festival Basel, Switzerland. Young artists can apply for 2019 Festival here. * Circus250 Caravan begins UK-wide tour at The Homecoming festival, Newcastle-under-Lyme. * Circus250: Art of the Show exhibition opens at the National Gallery of Ireland. * Circus250 Souvenir Book published celebrating the past, present and future of circus. * Degas’s Miss La La at the Cirque Fernando arrives at Weston Park Museum, Sheffield, on loan from the National Gallery for Show of Shows exhibition. * The Irish Times magazine features a double page spread on the Circus250 Caravan . * Southbank Centre, London, hosts Circus250 Takeover weekend with three days of events, workshops and performances just yards from the site of the original 1768 circus. * Public Record Office Northern Ireland, Belfast, holds its first one-day conference on the history of circus in Ireland. * Meet My Circus Family launched at Museum of London – circus families share their stories and experiences with hundreds of visitors. * Bristol Museum marks Museums at Night with a Circus extravaganza and the Circus250 Caravan attracting thousands of visitors. * StrongWomen Science show premieres at Swansea Science Festival in two sold-out shows, followed by Irish premiere at Kerry County Museum – also sold out. * Belfast – Tumble Circus’ Winter Circus in Writer’s Square. * Newcastle-under-Lyme – Philip Astley Project celebrates their special year with an Extreme Cake Makeover from Channel 4. Of course there was much much more, and you can still share your memories or plans for 2019 on our Facebook page. Want to see some stats? We got stats! 🎪 Over 500 events listed on CircusTalk www.circustalk.com/circus250programmes. staging over 80 The Secret Life of a Circus Caravan shows. 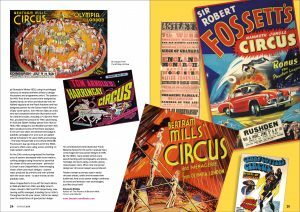 🎪 Over 400 articles appear in magazines and newspapers on Circus250 including major feature in Art Quarterly and Country Life, Time Out, Evening Standard, Independent, Yorkshire Post Magazine, Times, Daily Mail, Sun, ITV News, BBC Breakfast and BBC London News. 🎪 Over 16 exhibitions, 10 conferences and 6 conventions. into schools, libraries, museums, theatres. 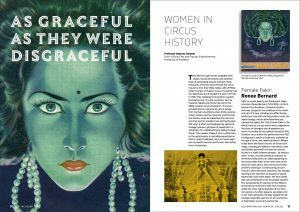 🎪 12 original essays commissioned for Circus250 Souvenir Book and over 900 copies distributed worldwide. 🎪 Over 3500 friends and followers on Facebook and Twitter. Circus250 has been a phenomenally successful year in which the profile of circus has been significantly raised throughout the UK and Ireland. Along with many other companies, organisations and individuals, this extraordinary vibrant anniversary has led to hundreds of events and performances being nurtured and blossoming. Circus250 has created three new shows as a result, with a fourth in development. In 2019 we will concentrate on presenting our own work. StrongWomen Science, The Secret Life of a Circus Caravan, and Meet My Circus Family are all touring in 2019 under the banner of our new production company, Circus250 Presents. We hope to see you at one of our shows.